The annual fee for a single member beginning in 2019 will be 750 € (about $870 US). 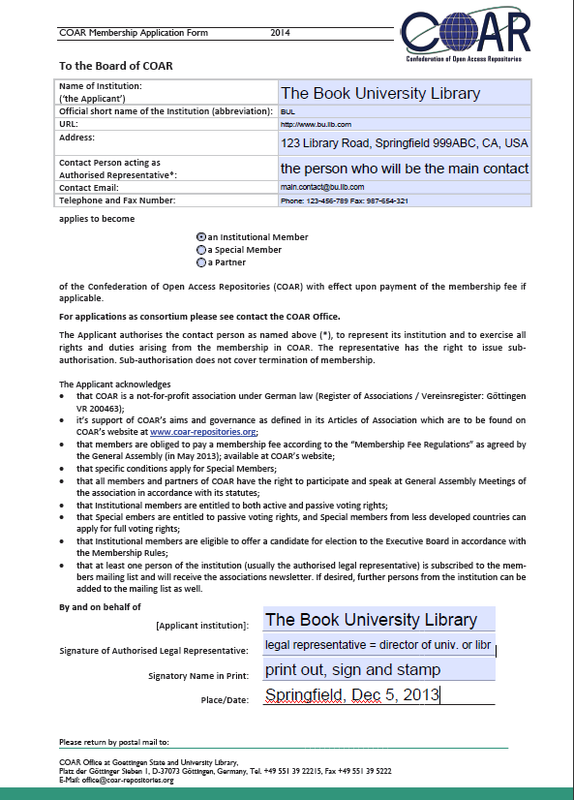 To become a member of COAR, first thing to do is to fill in the COAR application form. What kind of membership type fits for my institution? Institutional member: If your institution is a legal entity and, for this purpose, is defined as not-for-profit institutions of higher education, research, infrastructure, and/or technology. Special member: If your institution is located in one of the Least Developed Countries (LDCs) according to the list of the United Nations. Institutions from LDCs are exempt from regular membership fees, but expected to contribute through COAR activities. Consortium member: If your institution is a library organisation, professional association or consortium, which consist of institutions as mentioned above. This category includes national associations of libraries or repository organizations. Partner: If your institution is none of the mentioned above, but has equal aims and wants to contribute to the work of COAR. Membership Fees Regulations do not apply to partners who may contribute by sponsorship. What is the difference between a “contact person acting as authorized representative” and the “authorized legal representative”? A “person acting as authorized representative” is the person who is appointed by the institution/authorized legal representative to represent its institution and to exercise all rights and duties arising from the membership in COAR. The representative has the right to issue subauthorisation. Sub‐authorisation does not cover termination of membership. Sign the form by hand and stamp: For our records we need the form with your original signature and institutional stamp. Then, send the form to the COAR Office by postal mail. To let us know that the form is on its way, you could send a preliminary scan by email to office@coar-repositories.org. Your application has to be approved by the Executive Board. After that, you will be noticed as soon as possible by the COAR Office. Meanwhile you can discover the various forms of participation in COAR at our website.